It's Interview time again, and in the metaphorical chair is former Daggers winger Mark Janney. DoB - 2 December 1977, I’m 33. I’m good thanks. And how are things going for you at the moment? On a personal note things are going well, on the football front things are not so good. I haven’t played since February last year because of a ruptured hamstring. What is the thing you miss the most about being a Dagenham & Redbridge player? I don’t really miss being a Dagenham & Redbridge player to be honest, I just really appreciate the time I had there, it was a very special time with many great memories. What do you consider the best three games of your career? Exeter at home in the FA Cup, Hednesford at home in my first season in the conference (both Dagenham) and Borehamwood away in the FA Cup for Hornchurch a couple of years back. What are the Best Three Goals you've scored? A chip in the above mentioned game at Borehamwood, a 25 yard left footer away to Barnet with Dagenham and a header for Brentford at Gillingham with my first ever touch in league football! Who do you consider the best player you have played with? I’d have to pick Robbo for pure consistency, still performing week in week out as he has done for the last twenty years! Worst match you've played in? Not worst actual matches but the worst feeling after a game is a tossup between Chester at home for Dagenham in the ‘Boston’ season and the Play Off Final against Doncaster, don’t think I need to explain why! What is your least favourite away day? I always hated Leigh RMI, awful pitch and no atmosphere. Do you have any before/after game rituals? Why did you sign for the Daggers? Was there anything in particular that sealed the deal for you? I had been released by Tottenham the previous season and after unsuccessful trials at Colchester and Southend received a phone call from then manager Ted Hardy asking me to come training, the rest as they say is history! The ground was was round the corner from my house which helped as well! What do you enjoy the most about being a footballer? It’s a bit clichéd but being paid to do something that you absolutely love and the dressing room banter which is something special. What do you consider your biggest achievements? My England semi pro cap was a very proud moment. The cup runs at Dagenham and also finishing third in our first conference season when no one fancied us at all. When you hang up your boots will you take another role in football? Am looking to start my coaching badges very soon, I definitely want to become a manager in the future. Best room mate on away days? Paul Terry, he used to get up far too early though! Tolo Mas, Tim Cole, Tony Roberts……all as mad as they come! Telford away with the daggers in the first match at their new stadium. Dickie the physio arranged a secret sweepstake on the way up about how many times Garry Hill would say ‘spoil the party’, we sit down for the team talk and the first words out of his mouth were ‘we are here to spoil the party’ All the lads were burying our heads in our tracksuits! 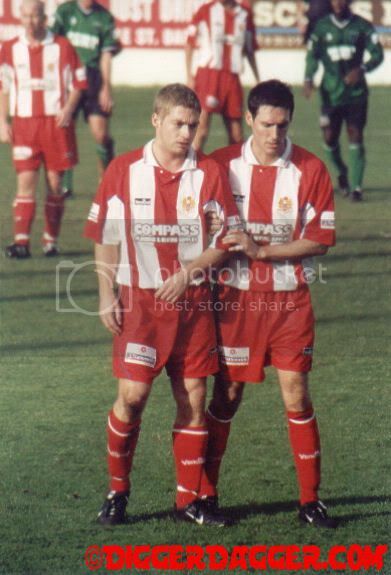 Ash (Vickers), Coley and I had a great time at Stevenage once as well, not that we remember much of it! GK Tony Roberts -Class act who was far too good to be non league. RB Lee Goodwin -Hard as nails and so reliable. LB Ashley Vickers -Such a nice bloke but once he crossed the line steer clear of him, this included training! CM Steve Heffer - A real dog in the middle of the park. CM Paul Terry - Great energy covering every blade of grass, great passer. 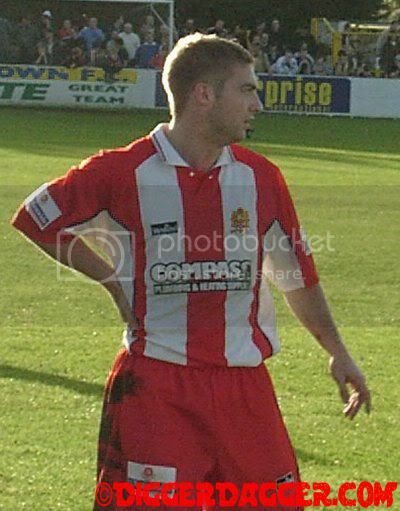 LW Jason Broom - A living non league legend, didn’t mind an injury though…..
CF Mark Stein - Give him the ball in the box and he would score, simple. Loved a moan if my crosses didn’t land within an inch of him though! What's next for you in football or life? Hopefully back playing for next season and I’m moving to my girlfriends in Cambridge next month so a bit of a new life! Thanks for sparing us this invasion into your private life! All the best! My pleasure, thanks and good luck to The Daggers for the rest of the season.